These baked chicken legs are pretty. I ate some these days. They are kind of tasty, in my opinion. Maybe you may like this style of chicken legs. Buy some chicken legs and mix them with salt, black pepper, ginger, honey, cooking wine, garlic, soy sauce, and ketchup, and left it for 2+ hours. Cut some potatoes and chestnuts, and mix them with some salt, oil and black pepper. 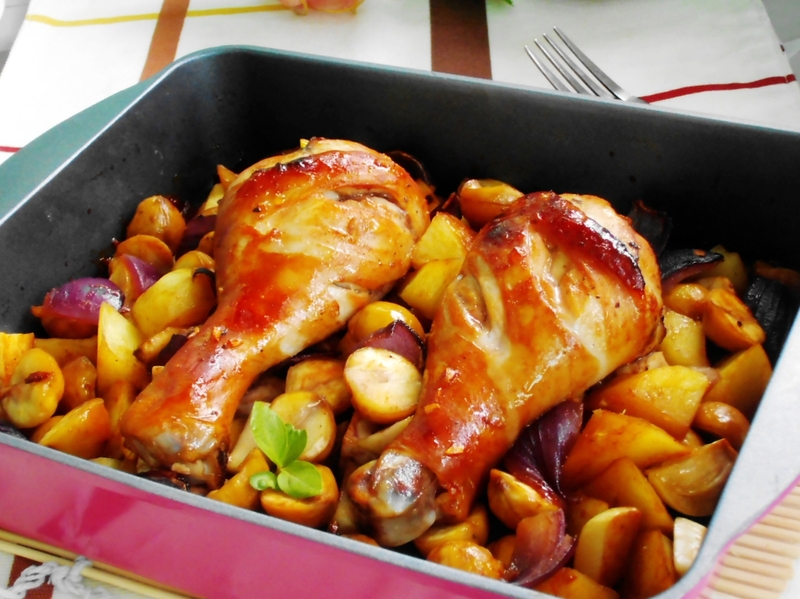 Place this mixture on the bottom of the baking pan and put the chicken legs on it and pour the mentioned above sauce (the salt, black pepper, ginger, honey, cooking wine, garlic, soy sauce, and ketchup) on them. Put it in the preheated oven and bake it for 40 minutes (to 210 degree). Serve these chicken legs hot or warm.